After a Feb. 11 explosion at a Chevron hydro-fracking site near tiny Bobtown, Penn – which left a worker missing and presumed dead, and which released toxic chemicals in the area – the giant energy company sent letters to town residents referring to the "February 11 incident," saying that Chevron "recognizes the effect this has had on the community." Included in the letter was a coupon for a free pizza and soda. Gov. Cuomo, you have been stopping (at least for now) companies from fracking in New York State, but just think – you have been depriving us of the chance to have a fracking "incident" and to get free pizza. Shame on you! 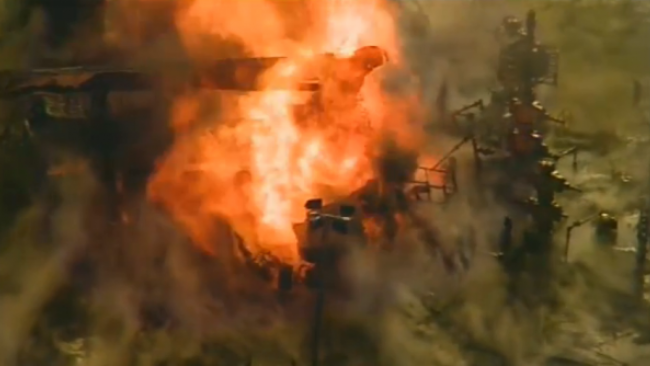 Pictured above is a video screenshot of the natural gas well explosion on Feb. 11 near Bobtown, Pa. When the tiny town of Bobtown, Pa. was stirred by an explosion at a nearby Chevron fracking site last week, residents feared toxic chemicals were being released into the air as a fire raged for five days. Chevron sprung into action, attempting to calm the town with an apology letter that included a small token of appreciation for putting up with a terrifying explosion, according to a Gizmodo report. The oil giant threw in a coupon for one free pizza and a 2-liter bottle of soda for citizens' troubles. But it's not just any pizza – it's a special combo pizza that's only redeemable before May 1. "Chevron recognizes the effect this has had on the community. We value being a responsible member of this community and will continue to strive to achieve incident-free operations. We are committed to taking action to safeguard our neighbors, our employees, our contractors and the environment." The Feb. 11 explosion was so intense that it shook the ground in Bobtown and left Ian McKee, a contractor working at the well, missing and presumed dead, says the Pittsburgh Post-Gazette.